The center of Athens was swarming with people carrying red and white Syriza flags on Thursday evening in what’s been described as the party’s biggest rally ever. Greece is having a snap parliamentary election on Sunday. It was triggered by the parliament’s failure in December to elect a president. "On Monday, national humiliation will be over,” said the party’s leader, Alexis Tsipras, according to Reuters. “We will finish with orders from abroad. We are asking for a first chance for Syriza. It might be the last chance for Greece." The promise of an end to austerity has struck a sensitive chord with Greeks wearied by cuts. "We want change because the mainstream parties have destroyed the country,” a rally participant, Katerina Pareskeva, 54, told the DPA news agency. “Our only hope at the moment is Syriza." Four pollsters on Thursday said Syriza was around 5 points ahead of its closest competitor, the ruling conservative New Democracy party. "What have five years of sacrifice got us? In a word: Nothing," Tsipras wrote in an article on Thursday, AP reported. "All we got is despair: 1.3 million unemployed, 3 million without health insurance, and pensioners who cannot afford to buy medicine." New Democracy claims Syriza’s ultimate goal is to drive Greece out of the EU. The leftists deny the accusations and say they want to stay, and even keep the euro. Brussels has nevertheless been nervous over Syriza’s plan to renegotiate Greece’s massive debt. The party is demanding that half of its 240 billion euro ($275 billion) bailout debt be written off. Syriza’s agenda has resonated with leftist countries in other European countries. Activists from Spain, Italy and Ireland were also there at the Thursday rally in Athens, according to Costas Isychos, Syriza's foreign policy head. He says Syriza’s victory would be a victory for all of Europe. 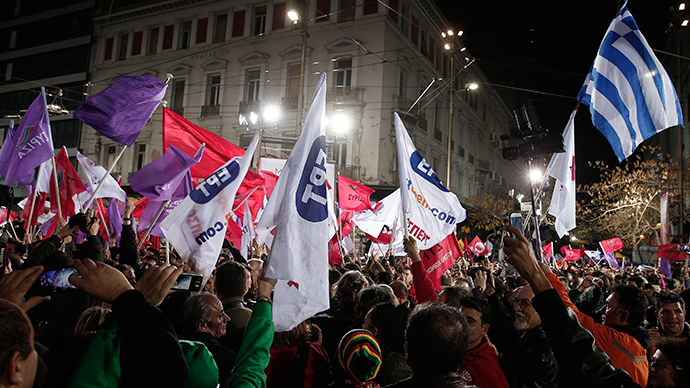 Spanish leftist party Podemos leader, Pablo Iglesias, also addressed the Athens crowd. "The wind of democratic change is blowing, a change in Europe, a change in Greece," Iglesias told the rally, according to Reuters. "It is called Syriza in Greece, and in Spain it is called Podemos." The International Monetary Fund has said it’s ready to work with whatever government is elected in Greece. "We do not see 'Grexit' [Greece’s exit from EU] as a possible outcome of Greece's election," IMF spokesman Bill Murray told reporters on Thursday. The Greek government was forced to impose strict fiscal austerity measures in exchange for €317 billion in financial assistance from the troika of creditors - the ECB, IMF and the EU. Most of the funds were used to bailout Greek banks. As a result of a continuous crisis, child poverty in Greece has almost doubled since 2008, according to a UN report. The rate of youth unemployment has risen above 50 percent. Mental health organizations say the suicide rate in the country has soared 45 percent. Greece’s public debt reached 315.5 billion euros or 176 percent of GDP during the third quarter of 2014 according to Eurostat. Other European countries with the public debt exceeding GDP are by Italy (131.8 percent), Portugal (131.4 percent) and Ireland (114.8 percent).